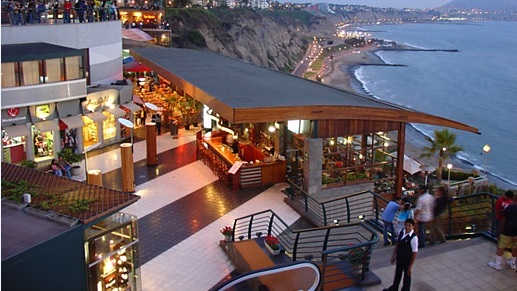 The Malecón of Miraflores is undoubtedly an area that besides being one of the safest in Lima, has a beautiful atmosphere and a more privileged view. Walking along this boardwalk is to breathe fresh air, enjoy the sound of the sea, see well-kept parks (the most visited is the Park of Love and its famous sculpture El Beso, inspired by the works of Catalan Gaudi), see beaches, cliffs , See people doing sport either running or on some of the free machines that are along, or enjoying a good couple time, with children, with friends or in family; Good coffee stalls, games for children, you will also find several excellent restaurants around. The ideal time to visit is in the evenings and even better if its a sunny day; You can walk, skate, ride a bicycle (if you do not have one, you can rent them) and for the more adventurous ride you can rent a paragliding flight (Raimondi Park serves as a launching ground for this sport). 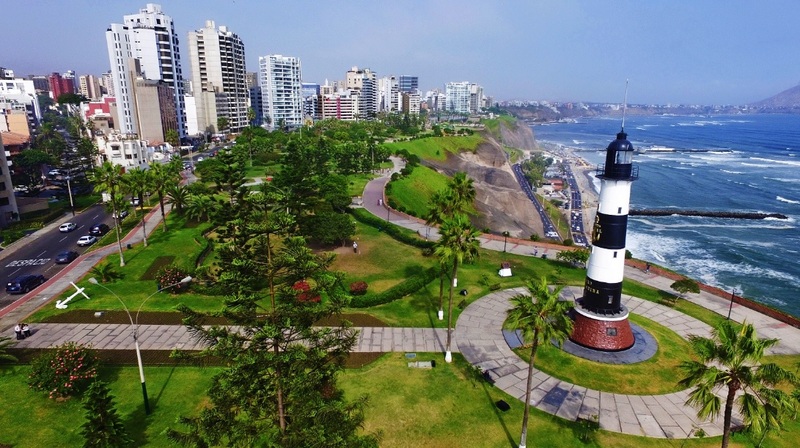 Definitely one of the tourist places of Lima that you can not miss if you travel to this city, ideal for tourists who want to spend a quiet day and enjoy a good landscape. ﻿Lima in 1 day. What to do, Where to go, What to eat, What to buy? ..
One day is really a short time, but I will try to recommend the most indispensable and attractive places or activities in Lima. Among the typical drinks you can find pisco sour, chilcano (both based on pisco) and a very rich refreshment based on Peruvian purple corn, chicha morada. 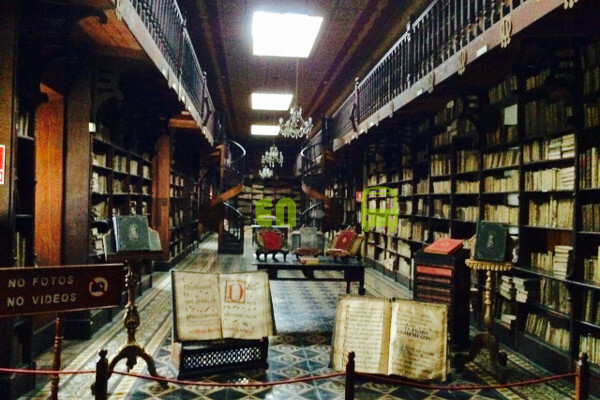 In the afternoon you could visit some Museum, the most complete and visited are: Larco Museum, Gold Museum, Lima Museum of Art MALI, Museum of Archeology and Anthropology. Another good option is the Citadel of Pachacamac, ruins located at 30 min. 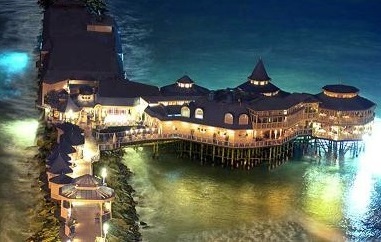 Of Lima (in a little more than 3 hours you can visit them and be back in Lima).Take time to shop !! In Miraflores at Av. Pettit Thouars (very close to the Ovalo of Miraflores) are the Craft Markets along 2 to 3 blocks, in case you want to buy some alpaca garment, silverware, paintings or just bring some souvenir to your family /friends. There are many curious things and of all price, they start to close the posts from 8:00 pm. At night you could visit the Reserve Park and tour the Magic Water Circuit that has the Guines Record as the largest Fountain Complex in the world in a Public Park; In addition to touring its 13 ornamental fountains you can enjoy its main show that is impressive as the joyful movements of the waters are mixed with games of multicolored lights and images that dance together to the rhythm of music. The Park opens from Wednesday to Sunday from 4:00 pm and the first Show is at 6:30 pm (ideally visit at night). Another good option for the night is to visit a Restaurant with Dinner Show, the best known and recommended in Lima are Brisas del Titicaca (in the Center of Lima) or La Damajuana (in Barranco to 5 min of Miraflores), in addition to the dishes Typical Peruvians offer a typical Peruvian Dance Show, a real show. And if you still have energy you can go to a bar or lounge, in Miraflores and / or Barranco the majority are concentrated, they are very good and for all tastes, I leave you with some options: Sukha Buda Lounge, Avalon, 5th. Avenue, Bizarro, Gothica, Victoria's Bar, La Trastienda, Green Crocodile, Picas Bar (the latter have live music), among others. 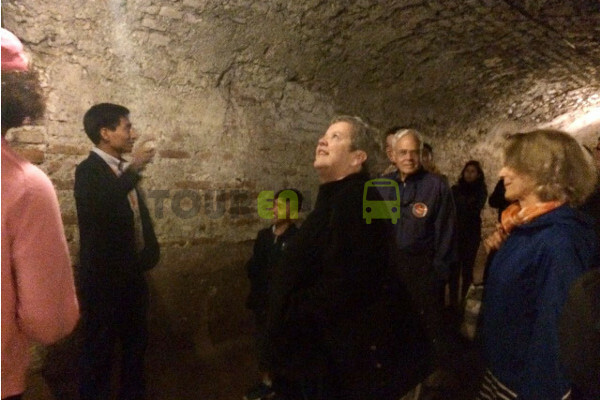 Here you can find more tourist places of Lima and options of tours with discounts throughout the year. If you are passing through the capital of Peru, one of the places you can not miss is the Historical Center of Lima; Walking around is really a delight to behold, you will find its most representative buildings such as the Government Palace, the Lima Cathedral, the Archbishop's Palace, the Municipal Palace, the Station of the Desamparados, Republicans Houses, Colonial Balconies, The Monumental Complex of San Francisco and many others. 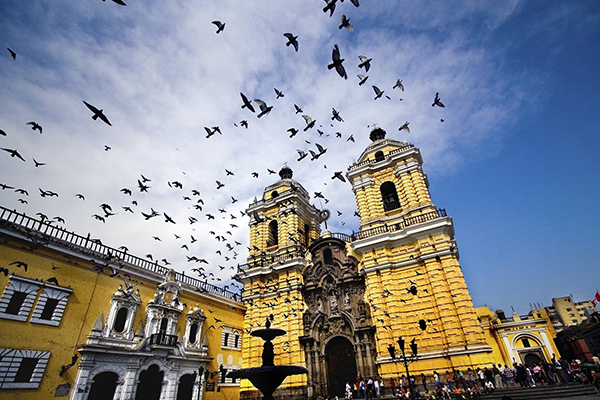 And I am going to stop in this last one, one of the most beautiful and emblematic churches of Lima that draws attention by its unmistakable and striking yellow color of its baroque facade. I took a classic Lima City Tour recently that included entrance to the San Francisco Convent or also called San Francisco Church; A very interesting visit not only by its Library which houses on average 25,000 copies made mostly with animal skins and kept in very good condition, within them some volumes of the first Dictionary edited by the Royal Academy of the Spanish Language - This library is considered the oldest of Latin America - but mainly for its Catacombs, a series of subterranean galleries with vaulted ceilings and planes joined by passages and arches of point that served as cemetery for the ancient inhabitants of Lima in the time of the Colony (until the early nineteenth century) and which housed more than 20,000 people. At that time they had the belief that being buried under a church would be closer to the sky at the time of their death, that is why the cost was high and only wealthy people could have access to a burial in the crypts or Catacombs of San Francisco. Along the way, one can observe contiguous rectangular sepulchres where the coffins were once placed on top of each other separated by layers of earth and quicklime, besides wells of 10 meters deep filled with skulls, femurs, tibias and other parts of bodies that Have been ordered and organized to make the tour more "pleasant" or attractive, and is that it really is what draws the most attention to visitors (of course, if they are not sensitive people).It is also said that there are secret passages that would connect with the Government Palace and the Desamparados Station. thats all for today i hope you enjoyed my article See you soon! Opening hours of the San Francisco Convent: Monday to Sunday from 9:30 am to 5:30 pm. Approximate distances by car: From Miraflores 30 min / From San Isidro 25 min / From the airport 40 min. Tours and Rates Average: In Lima there are 2 types of experiences in tours, in conventional tourist buses that include pick-up / return to your hotel (average rate between $ 33.00 and $ 40.00 dollars) and in panoramic buses of 2 floors without roof that have a Specific departure point (Between $ 25.00 and $ 29.00).